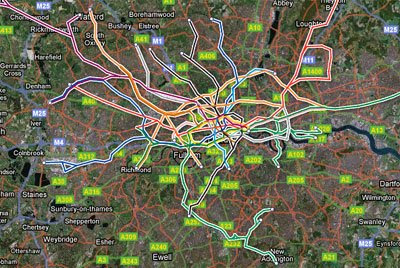 Google have today launched a new transit layer for Google Maps. The new layer is available for 50 cities around the world. To switch on the layer go to the 'More' button and select the Transit tab. You can also turn on the layer by clicking on a public transit icon on the map. "the objective of the Transit Layer is to overlay lines visually on Google Maps. Think of a virtual metro map on top of Google Maps." The full list of cities is Belo Horizonte, Berlin, Bordeaux, Brasilia, Cairo, Capetown, Caracas, Chicago, Copenhagen, Dallas, Dortmund, Duisburg, Düsseldorf, Ekaterinburg, Essen, Frankfurt, Genoa, Guadalajara, Hamburg, Helsinki, Johannesburg, Kazan, Köln, Lille, Lisbon, London, Lyon, Madrid, Marseille, Medellin, Mexico City, Melbourne, Monterrey, Montreal, Munich, Naples, Nizhniy Novgorod, Oslo, Paris, Perth, Portland, Porto, Porto Alegre, Prague, Pretoria, Recife, Rennes, Rio de Janeiro, Samara, San Francisco, Santiago, Sao Paulo, Seattle, Strasbourg, Toulouse, Tunis, Vienna, Warsaw. when will mainland EU get traffic layer??? UK has had the traffic layer for quite some time now! germany, france, spain and italy really could need a traffic layer update!!! I would have liked to be able to click on the individual lines icons on the left and see the line on the map.